Peat, or turf, is an accumulation of partially decayed vegetation. Peat forms in wetland bogs, moors, mires, and swamps. Peat forms when plant material, usually in marshy areas, is inhibited from decaying fully by acidic and anaerobic conditions. It is composed mainly of marshland vegetation: trees, grasses, fungi, as well as other types of organic remains, such as insects, and animal remains. Under certain conditions, the decomposition of the latter (in the absence of oxygen) is inhibited. 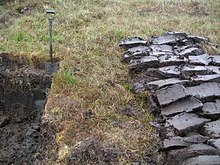 Peat formed in very wet conditions accumulates faster, and is less decomposed, than that in drier places. This allows climatologists to use peat as an indicator of climatic change. The composition of peat can also be used to reconstruct ancient ecologies by examining the types and quantities of its organic constituents. Under the proper conditions, peat is the earliest stage in the formation of coal. The coal measures of the Pennsylvanian period were laid down in a gigantic tropical river basin, and later squeezed and heated to form the metamorphic rock we call 'coal'. Most modern peat bogs formed in high latitudes after the retreat of the glaciers at the end of the last ice age some 9,000 years ago. They usually grow slowly, at the rate of about a millimetre per year. The peat in the world's peatlands has been forming for 360 million years and contains 550 Gigatonnes of carbon. Peat is harvested as an important source of fuel in certain parts of the world. By volume, there are about 4 trillion m³ of peat in the world covering a total of around 2% of global land area (about 3 million km²), containing about 8 billion terajoules of energy. Peat fires are used to dry malted barley for use in Scotch whisky distillation. This gives Scotch whisky its distinctive smoky flavour, often called "peatiness". Although peat has many uses for humans, it also presents problems. When dry, it can be a major fire hazard, as peat fires can burn almost indefinitely (or at least until the fuel is exhausted). Peat fires can even burn underground, reigniting after the winter, provided there is a source of oxygen. Peat deposits also pose major difficulties to builders of structures, roads, and railways, as they are highly compressible under even small loads. When the West Highland Line was built across Rannoch Moor in western Scotland, its builders had to float the tracks on a mattress of tree roots, brushwood and thousands of tons of earth and ashes.